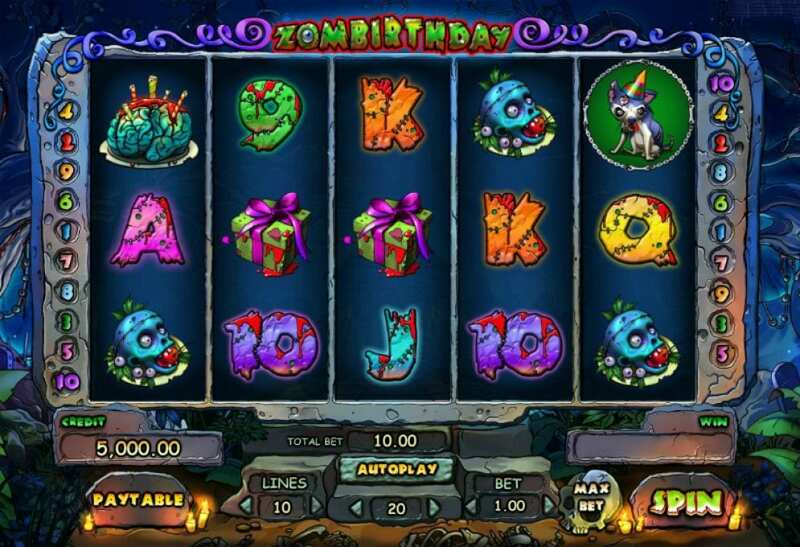 Heres an all new Zombie themed online slots game. Who would have thought that your birthday celebrations could continue into the years after your death? Well this 5 reel certainly clarifies the picture. Zombirthday is about the celebration of a group of Zombies birthdays. You’d think by now the slot game themes would be running a bit thin, in theory they are, but the quality of the slots is still pretty good. Spin through 5 reels of birthday cake brains, zombie platters, and blood-drivelling letters. You can read more about this developer's other games here. 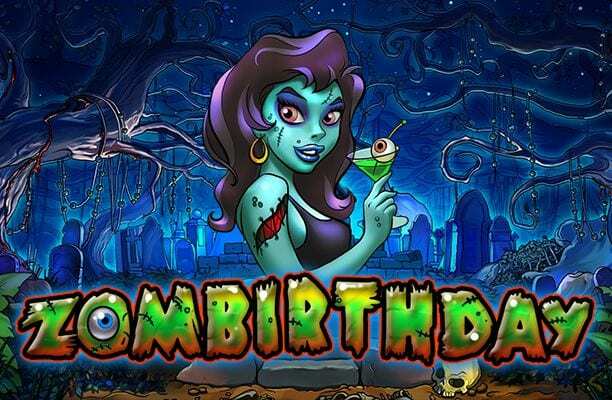 Playson are back with this wonderful slot game, Zombirthday. You can always tell a Playson game by its signature animation and the small effects that are visible in the backgrounds of the game boards. If you’re looking to play any other games from Playson’s repertoire then why not try Art of the Heist, Bumper Crop, and Viking Gods to get a taste of some of the best action on Wizard Slots. There’s no risk of a hangover if you’re already dead, so why not have a drink and take a spin on this nightmarish slot game. The game that features the signature Playson graphics is set in the foliage of haunted cemetery with drooping trees and uncompromising shrubbery. Every so often some the logo of the game pulsates and it’s time for the spins to begin. The symbols on this game include a blue skull on a platter that has an apple protruding out of its gaping mouth. The main man at this party, the birthday boy is a green zombie wearing a paper hat and there’s also a bodacious blue female zombie who provides the brunt of the fun for the other partygoers. In addition there’s also a perfectly edible brain cake, and a small rabies-ridden zombie dog. As always there’s some playing card symbols that make up the rest of the gameboard. Like all good games, players can take advantage of the autoplay feature that will allow you to hide behind a pillow if things become a bit too scary. The green birthday zombie is the game’s WILD. As all the experienced gamers will know, the WILD can be transferred for any of the symbols on the game other than the SCATTER. Think of those winlines. Locate 5 of these ZOMBIE WILDS and you should expect a significant cash payout. The game’s SCATTER is the bodacious blue zombie that was mentioned earlier in the description. Rife with lice, and rife with free spins match a couple of this baby and you could be seeing a return of 15 free spins along with some spine-tingling multiplier rewards. Like all good zombie 5 reels, Playson have offered the chance for you to gamble your winnings, with the all or nothing GAMBLE feature. 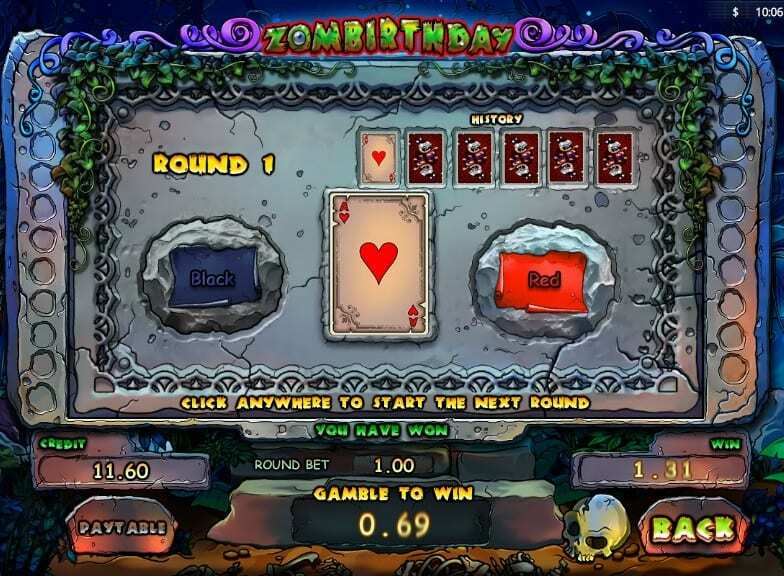 Do you have the gonads to look the Zombies dead in the eye and risk it all to become the greatest slot player of all-time? Thought not.